Driver attempts to run down officer in police station parking lot in Negev. One suspect arrested, second on the loose. 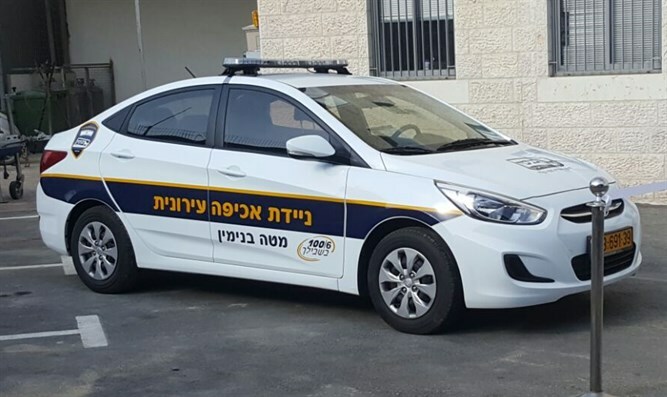 Police arrested a driver outside of a police station in southern Israel Sunday after the suspect attempted to run down an officer in the station parking lot. The incident occurred in the Ayarut police station parking lot northeast of Beer Sheva. No injuries were reported. After the attempted ramming, officers in the station were alerted and helped apprehend the driver and place him under arrest. During the incident, the driver and a second individual in the car attempted to escape, but an officer at the scene shot out the car’s tires. Police then pursued the vehicle, prompting the driver and his accomplice to exit the car and flee on foot. Authorities managed to capture the driver, but were unable to locate the second suspect. Police are conducting searches of the area for the second suspect. A police spokesperson reported that investigators believe the incident was likely criminal in nature. Two relatives of the driver who were present at the police station during the attempted ramming have been detained for questioning.